Hollywood clichés and formulas is what “Did you hear about the Morgans?” is all about. Even though critics have slammed this film, I was actually quite apprehensive about this comedy starring Sarah Jessica Parker and Hugh Grant as a separated married couple in witness protection. You pretty much already know how the film is about to play out and even though critics have been wrong before, at times, it was like watching grass grow. The highlight of the movie was Sarah Jessica Parker who did perform quite strongly in this film, only to be let down by her co-star Grant who plays his stereotypical English character that we’ve all seen it before. The story begins with Paul (Grant) attempting to reconcile their marriage with Meryl Morgan (Parker) and when they both witness a murder, they are rushed into the witness protection scheme. The pair are moved to a secluded country town in Wyoming where they are under the protection of the local sheriff (Sam Elliot) and his wife (Mary Steenburgen). To make matters worse, Elliot, although charming plays a stock standard Sheriff that only adds to the stereotypical nature of the film which are country bumpkins are an uncivilised folk but if you spend enough time with them, they’re actually decent people. Grant’s character also uses the setting of the country bumpkins for his sometimes witty one-liners but no matter how hard the actors try, it seems like oil and water… nothing really jells together. There is even a subplot between the Morgan’s assistants, played by Elisabeth Moss and Jesse Liebman who have a forced and uneasy relationship thrust upon them as they attempt to hold together the businesses of Paul and Meryl. Totally unnecessary. However, there are some funny scenes in the movie but for the majority, it runs at low gear from the very first moments of this film. Another problem is that you already know where the movie is headed, where the characters are going and how it will end. It's a shame because Parker tries! In terms of video quality, everything is what you would expect from a Sony release with sharp images, vibrant colours and deep levels of black. The audio compliments the movie nicely but once again, it’s a shame about the main flick. Add in a few special features for those who want to get into the headspace of the creators and it neatly rounds out this presentation on DVD. 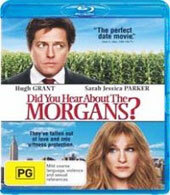 I was expecting quite a bit more when I watched Did you hear about the Morgans? and it seems like the original movie critics got it right this time. The star of the movie is Sarah Jessica Parker who is a treat to watch, it’s just a shame about the script and perhaps if there was another leading man, the movie may have gone in another direction.